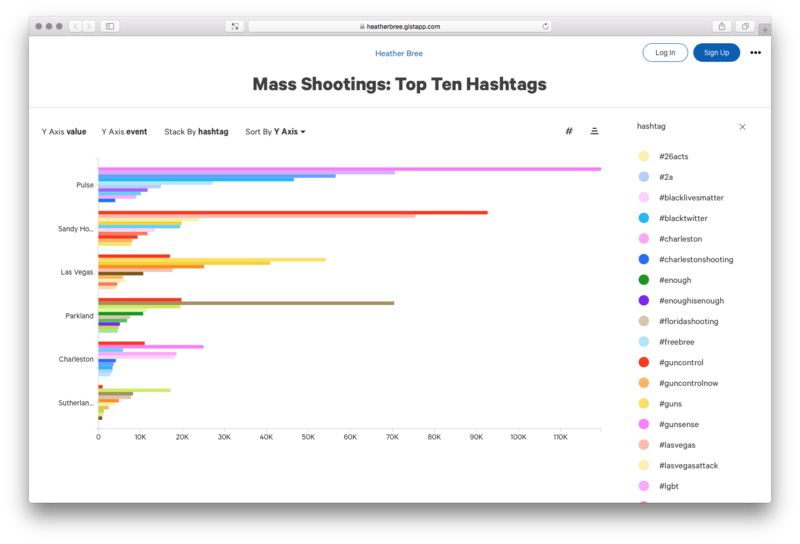 Her article, “#MassShootings on Twitter”, uses a number of visualizations to explore how social media conversations regarding these devastating shootings have shifted and compared over time. 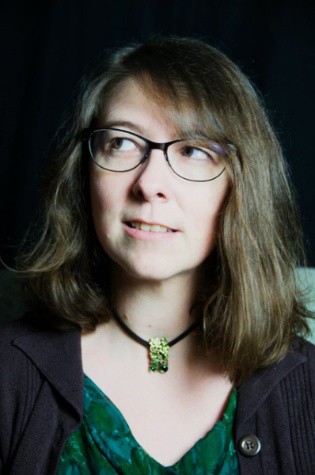 With a bar chart map, she provides a visual breakdown of hashtags, tweets, and usernames by different mass shootings that have taken place in the United States. Bree distinguishes how the Parkland shooting generated the most amount of tweets, while the Pulse event had the most amount of unique usernames that tweeted about the event. A line graph visualization provides further insight on how Twitter hashtag activity spanned for each event in a 30 day time range. The view, which compares user engagement from tweets, retweets, and favorites, shows trends of Twitter activity in the days following the shootings. In this visualization, the Parkland shooting is shown to have a relatively greater amount of Twitter engagement compared the other events. These peaks, namely on day 8 and day 29, resulted from events such as the Tallahassee gun control protests and the nationwide school walkout day. What significance do data visualizations have in revealing patterns of social media conversations, especially those around important problems of gun violence? 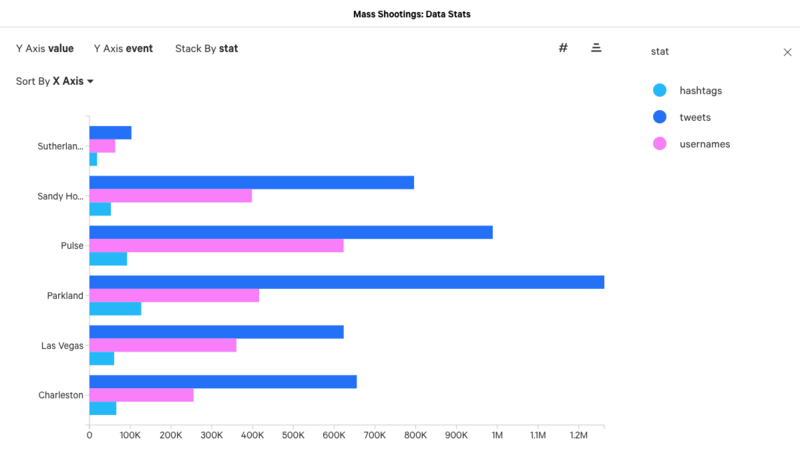 Knowledge of what stories data have to tell, like the Twitter engagement around mass shootings, can help draw attention to issues the public cares about and guide the decisions of policy makers. Gist is a data exploration platform that makes information accessible for everyday users and everyday stories. 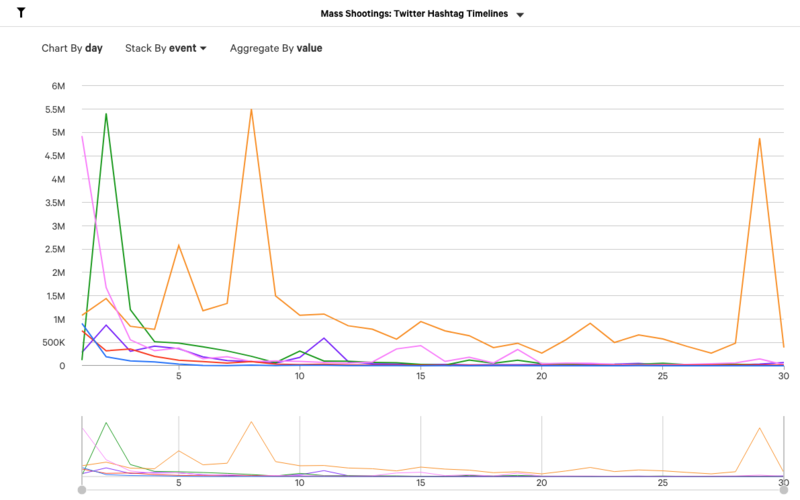 Check out Heather Bree’s article on mass shootings on Twitter or create your own data-driven story.